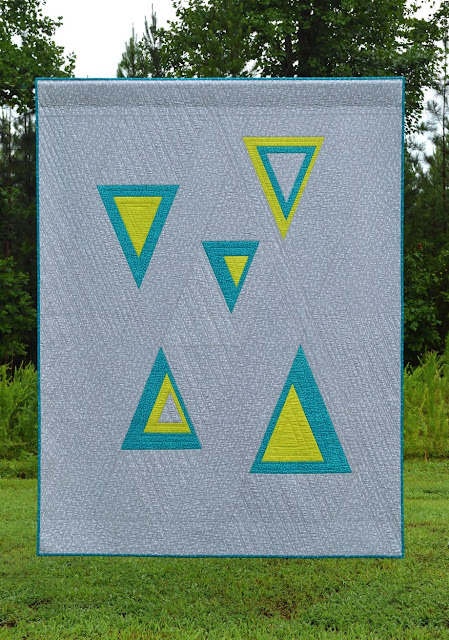 This is Atypical Angles which was the Modern Quilt Guild's July 2018 Quilt of the Month. The isosceles triangle blocks were assembled log-cabin style using provided templates in two sizes. 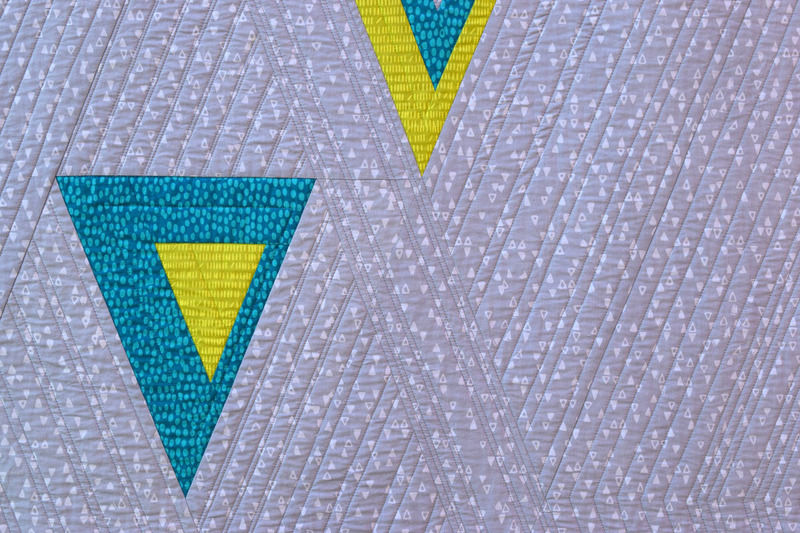 I've labeled the skill level as challenging since the quilt top was pieced in diagonal rows which allows the triangles to be shifted to your liking. Can you identify the diagonal rows? 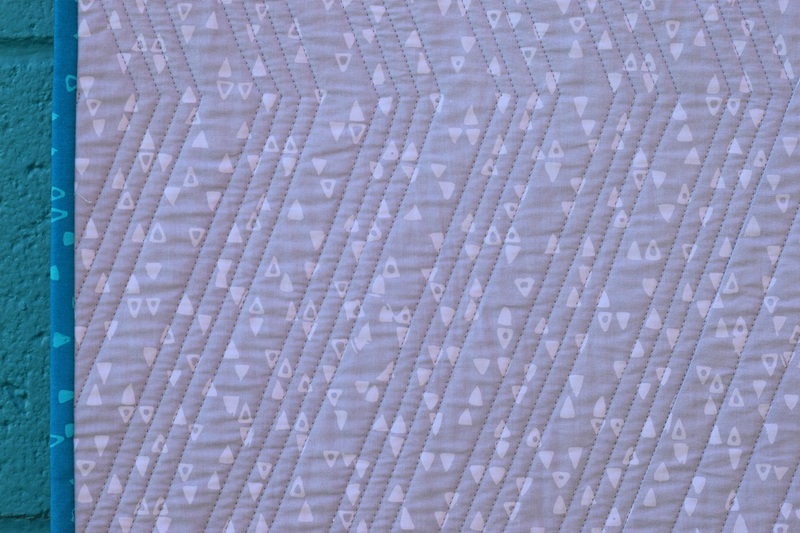 Atypical Angles was all quilted on my Bernina 153 using the walking foot in parallel lines. In the background, I used Aurifil cotton 40wt and inside the triangles Aurifil 50wt was used. In the quilt stats below you will find the Aurifil weights and colors used for Atypical Angles. I changed the direction of the the quilting and varied the width of parallel lines in each section of the quilt for interest. There was a lot of marking and quilt wrangling when quilting Atypical Angles. 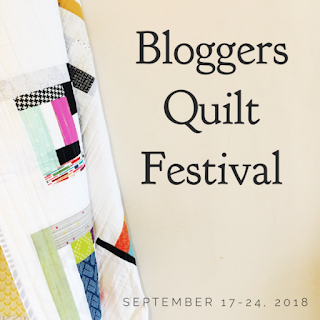 Tying off and burying threads is not my favorite, so, many times, I traveled over previously quilted lines and turned the quilt back and forth where I could. That way, one entire section could be quilted at a time without burying any threads. I loved working with the Modern Batiks by Studio E Fabrics. I was instantly drawn to the Pencil Dashes in Lime when I saw it in my local Bernina quilt shop. The background Triangles in Light Gray. The binding is Triangles in Peacock. Here's another shot taken at the same industrial building. I thought the roll-up door in three shades of gray was interesting but I ended up using the same painted wall shown in this post and this one. 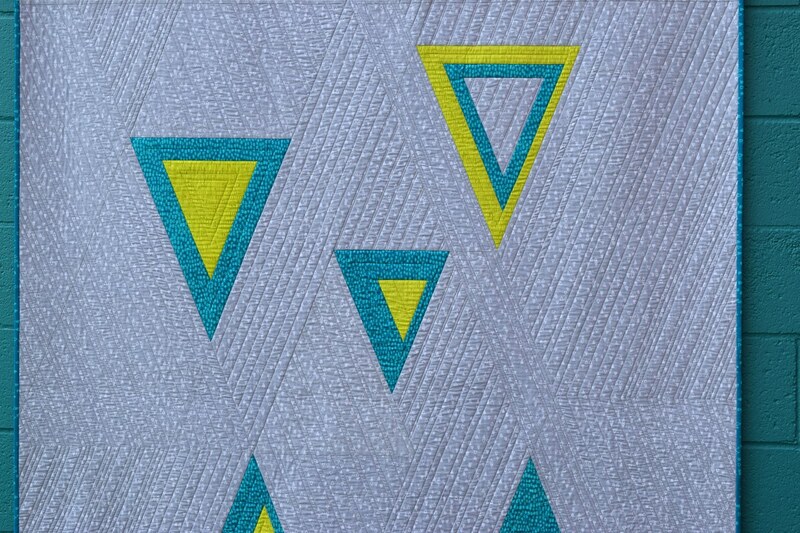 I'm excited that Atypical Angles will be hanging at QuiltCon 2019 taking place in Nashville, TN. Many thanks to Cheryl (Meadow Mist Designs) for drawing the pattern illustrations and to Cheryl and Patty (Elm Street Quilts) for reading through the pattern and offering suggestions. 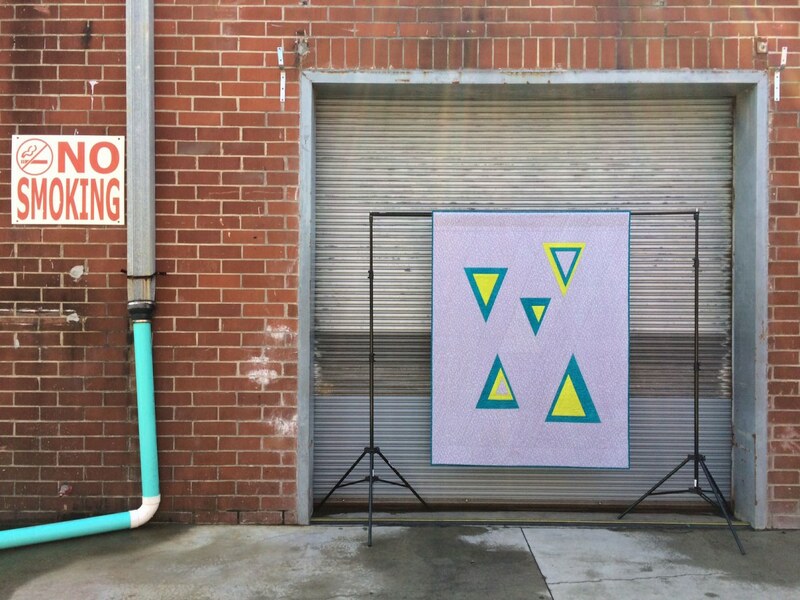 If you are a member of the MQG, Atypical Angles is available here on the MQG new website. Finished size: 52" x 70"
Thread: Aurifil 50wt in Medium Gray 2605 for piecing; Aurifil 40wt in Medium Gray 2605 for quilting the background; and Aurifil 50wt in Light Leaf Green 1147 and Dark Turquoise 4182 for quilting the triangles. Paige, this is a lovely quilt. The quilting is so appropriate and so neat that I am jealous. The diagonal piecing is genius. Did you paint the wall turquoise for the pictures :-p The aqua pipe adds to the picture too, you know. It is a quilt worthy of a ribbon or two!!! Paige this is perfect. I love the straight line quilting, I would love to be a bird on your shoulder when you did this quilting. Thanks for sharing and wish I could see this one in Nashville. The quilting choices and changes in direction really help hide the assembly seam lines, Paige (but I think I found them after a long hard look). 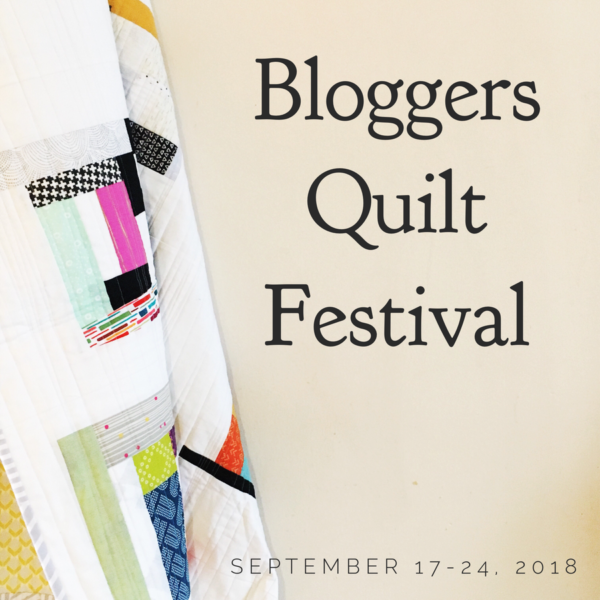 It will be fantastic to get to see your quilt in person in Nashville! Thank you! FMQ is really my go-to quilting! Paige, this is such a cool quilt...love the brights with the grey background. This I see a cool pattern and your quilting is just perfect to accentuate the triangles. Nice photo shoot as well. Those colors pop right out of the background. Your quilting is so straight and evenly spaced. Amazing looking quilt. First, what a great photo background. I love the quilt - not sure I noticed your quilting the first time. It is just perfect! Oh goodness, everything about this quilt is fabulous! Great work Paige. Lovely quilt Paige! I really like that lime green with the matchstick looking print too! Paige I knew this was your entry/work the minute I saw it. I love how distinctive your style is. Great quilt! Hi Paige, it's nice to see another one of your beautiful quilts, I love the fabrics and colors, they're so Paige. I'm not a big fan of batiks but the ones on your quilt makes me want to check them out, you're right about the lime green pencil print. I love the quilting. I am just getting into the quilting side of the hobby and love to see a quilt like this that really uses simple pattern to say WOW on the quilt. Great job! Congrats on being exhibited at Quiltcon! 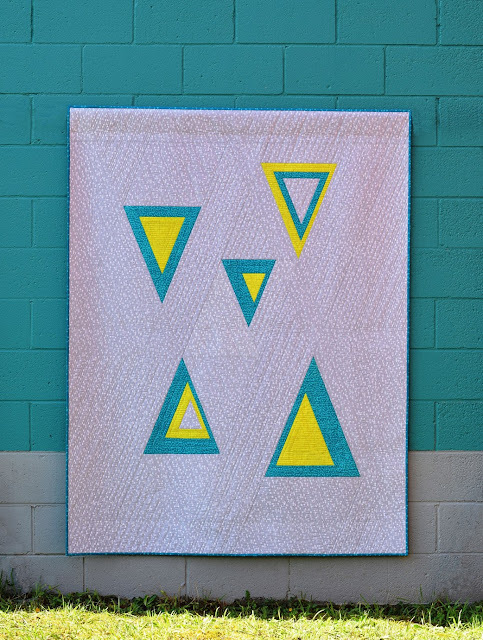 I am really loving quilts like this one which have asymmetry and a lot of negative space. And teal and citrus together--my current favourite colour combo! Stunning quilt! The colours really pop against the grey and the quilting is amazing! This is among my favorite quilts that you've made. Thanks for sharing the details about your process - using different thread weights, walking foot quilting. I need to hang out with you to find out how you make your quilts so flat and straight-hanging! I find that domestic machine quilting smooches a quilt, and can make it difficult to block. I rarely have a quilt turn out flat, though I always go through the process of washing, blocking, squaring-up, and even measuring binding before sewing it to each side. Anyway, this is a gorgeous quilt, Paige! I'm looking forward to seeing it in person at QuiltCon. Just stunning! Paige, I really love your work. Take care, Mary. Love this quilt, and my first thought was, what a lot of ends to bury!